Renewable underfloor heating solutions are a great alternative to oil and gas boilers, and are much more energy efficient. With rising energy prices and finite reserves of fossil fuels, it’s important to consider renewable energy options if you want a truly sustainable underfloor heating system. Not only will you be doing your bit for the environment, you’ll also save money in the long run. There are various options to consider when it comes to underfloor heating renewables. EcoHeatCool have years of experience in the design and installation of various combinations for the residential and commercial sectors, including government buildings. Our renewable underfloor heating solutions are ideal for both new builds and refurbishments alike. To emphasise the importance of reducing our carbon footprint, the government have introduced a domestic Renewable Heat Incentive (RHI) scheme. The RHI scheme is a financial incentive that promotes the use of renewable energy sources. You can find out more about it here. Heat pumps are among the best renewable underfloor heating solutions available. They’re energy efficient, cost effective and even qualify for the government’s RHI incentive program. Since they’re also hidden out of sight and are effective all year round, they’re a very attractive solution. Heat Pumps take heat from the ground, air or water and use it for both space heating and hot water. To help explain how they work, imagine a fridge that’s operating in reverse. A fridge takes heat from the food you put in it, and pumps that into the kitchen, keeping the food cold. Heat pumps take heat from the ground, air or water, and pump it into your property, keeping it warm. By reversing the cycle, you also get the benefit of using cold water for cooling in the summer. Heat pumps do use electricity, and so have a certain amount of impact on the environment. However, the energy they absorb from the air, ground or water is constantly being renewed making them extremely efficient overall. 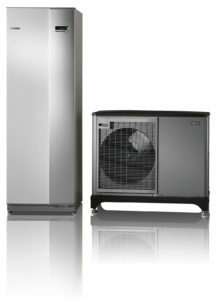 An Air Source Heat Pump (ASHP) is a system that absorbs heat from the outside air and turns it into useful heat energy. They can even absorb heat when the outside temperature is as low as -15 °C. This heat energy can be used for both space heating and domestic hot water. For more information about sustainable heating solutions using air source heat pumps with underfloor heating visit the National Energy Savings Trust website. A Ground Source Heat Pump (GSHP) is a unit which absorbs heat either directly or indirectly from the ground. This is done by extracting and re-injecting water from an aquifer (direct) or by using a ground heat exchanger (indirect). A closed loop of pipework buried within the ground (vertically or horizontally) is called “the exchanger”. It then upgrades this low temperature heat into useful higher temperature heat energy for space heating and domestic hot water. For more information about sustainable heating solutions using ground source heat pumps with underfloor heating visit the National Energy Savings Trust website. Water Source Heat Pumps (WSHP) work in a similar fashion to air and ground source heat pumps. The obvious difference being that they extract heat from open water courses such as rivers, lakes, canals, and even sea water. Flexible pipe work is submerged in a body of water. The heat pump pushes fluid through the pipe network, and the fluid absorbs heat from the surrounding water. The fluid is then compressed by an electric compressor to raise the temperature. A heat exchanger takes the heat and uses it for space heating or hot water via your underfloor heating system. When EcoHeatCool design underfloor heating systems, we do so in such a way that optimises the efficiency of heat pumps. Not only will your renewable energy heating solution be more efficient, it will be delivering a constant, controlled heat that can help reduce running costs and your carbon footprint all at the same time. If you have any questions about heat pumps and how they can save you money and reduce your carbon footprint, then contact us here today. Another renewable underfloor heating solution that EcoHeatCool have vast experience with is District Heating. A District Heating scheme is a network of insulated pipes used to deliver hot water, from the point of generation to a district or group of buildings. Networks can vary in size and transfer heat between houses a few hundred yards apart to a network reaching miles that delivers heat to entire communities or industrial areas. The network enables valuable energy, which is all too often wasted, to be captured and supplied to householders and businesses. A District Heating network can be supplied by a number of sources including power stations, “energy from waste” (incineration), industry, biomass and geothermal sources. District heating plants can provide higher efficiency and better pollution control than localized boilers and your underfloor heating system can tap into this economical and sustainable heat source. If you’d like advice on District Heating networks, or any other form of underfloor heating renewables, contact us here today and speak with a member of the experienced EcoHeatCool team. Because, “Underneath it all, there’s knowledge”.